Durban "World Conference against Racism, Racial Discrimination, Xenophobia and Related Intolerance "
"World Conference against Racism, Racial Discrimination, Xenophobia and Related Intolerance"
Picture by Reuters - Durban "World Conference against Racism, Racial Discrimination, Xenophobia and Related Intolerance"
Durban I majored on branding Israel as an Apartheid state – in the land where apartheid was once practiced, and using Archbishop Desmond Tutu’s credibility from that time, in the campaign against Israel. Actually it was marked by wrangling about Middle Eastern and African demands for reparations for slavery, attempts by Islamic countries to brand Israel as racist, and to seek to equate criticism of a religious faith (Islam) with violation of human rights. The UN's moral credibility was destroyed as Durban 2, led by a committee consisting of human rights violators such as Libya, Iran and Cuba, provided a platform for Iran's President Ahmadinejad to deliver a hate speech against Israel. A United Nations conference can never have credibility, or value, if it is used to attack one country — Israel — especially when so many other countries have truly abysmal human rights records, including China, Sudan and Iran. While all direct references to Israel and the Israel-Palestinian conflict had been removed in an attempt to keep the European Union from boycotting the conference, it still implicitly singled out Israel. The first clause in the new document reaffirmed the declaration of 'Durban 1,' which calls Israel a racist state, and the change was cosmetic only. The edited version was crafted by a committee headed by Russia. After the indecision, USA, Canada and Italy were the only nations to boycott Durban II. Other EU countries, as well as Australia and New Zealand, failed to carry out their threats to boycott. Iranian tyrant Mahmoud Ahmadinejad’s invective against the “Zionist Entity” didn’t go over too well. Three clown-wigged hecklers interrupted Ahmadinejad's speech with cries of "racism". The students said they wore clown outfits in order to "show that this speech and the entire conference is a circus." Then a huge number of European diplomats walked out in disgust. The final conference communique, was signed earlier than expected to avoid further controversies. While there had been improvements in the communique, it still affirmed the conclusions of the last one, implicitly still singling out Israel. The conference became an instrument for racism itself, particularly directed against Israel. This agenda was driven by Iran and a number of Arab states, and primarily by the participants in the antisemitic NGO (non-governmental organization) Forum. The final declaration of the NGO Forum – that labelled Israeli counter-terrorism measures as “war crimes,” revived the “Zionism is racism” slogan, and introduced the “Durban Strategy” of isolating Israel internationally, following the model of the campaign against apartheid in South Africa. 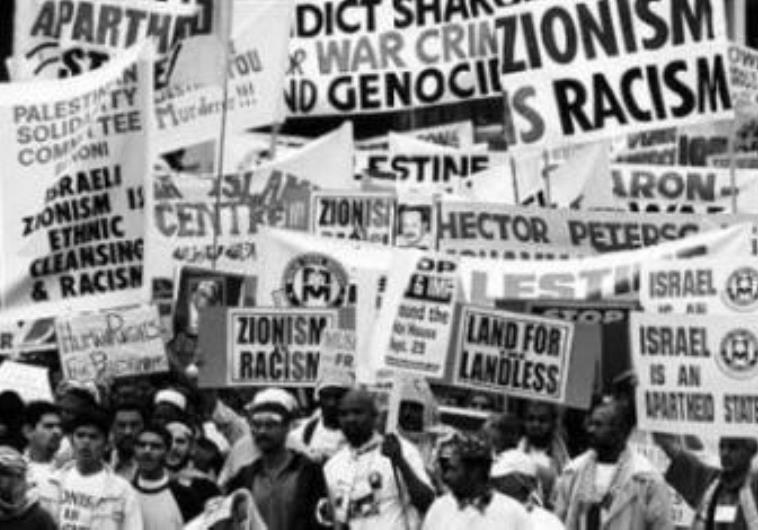 Israel and the United States walked out of the 2001 Durban conference in protest over draft conference texts branding Israel as a racist and apartheid state -- language that was later dropped. Among the attractions at Durban I were, …. On the grounds of the U.N. conference itself, the Arab Lawyers Union distributed pamphlets filled with grotesque caricatures of hook-nosed Jews depicted as Nazis, spearing Palestinian children, dripping blood from their fangs, with missiles bulging from their eyes or with pots of money nearby. Under the tent where the final NGO declaration was approved over the weekend, fliers were found with a photo of Hitler and the following question: "What if Hitler had won? There would be no Israel, and no Palestinian bloodshed." In a Palestinian-led march with thousands of participants, a placard was held aloft that read "Hitler Should Have Finished the Job." Nearby, someone was selling the most notorious of anti-Jewish tracts, "The Protocols of the Elders of Zion." Palestinians, presumably funded by the Arab world, spent millions to prepare for the conference. Activists say they saw workers unloading huge cartons of posters, banners and free T-shirts bearing slogans such as "Israel Is an Apartheid State" and "Zionism Is Racism." The Palestinians also handed out thousands of free kaffiyeh scarves in Palestinian national colors, which many participants happily draped around their necks. Nobel Prize winner Elie Wiesel was invited to Durban to speak, and initially accepted before reading the draft declarations. He withdrew saying, "I do not believe I can dialogue with hatred," Wiesel said, answering critics who believed the United States should have stayed at the conference and debated the controversial language. "Hatred stops dialogue, and there was so much hatred there that I got frightened." The Russell Tribunal “Are Israel’s practices against the Palestinian People in breach of the prohibition on Apartheid under International Law”. The web site www.russelltribunalonpalestine.com gives a clue as to what kind of prejudiced forum this will be; even the name "Russell Tribunal on Palestine" shows how entirely one sided this event is. A look at the list of jurors will confirm this; several well known anti-Israel campaigners and left wingers but nobody known as an advocate for Israel. As the tribunal bears the imprimatur of that great philosopher and peace activist Bertrand Russell, one expects the panellists to take seriously the principles of moral integrity he exhorted. Russell advised “When you are studying any matter or considering any philosophy ask yourself only what are the facts and what is the truth that the facts bear out. Never let yourself be diverted either by what you wish to believe or by what you think will have beneficial social effects if it were believed. Look only and solely at what are the facts”. Sadly, contrary to Russell’s advice, the Tribunal appears to be reinforcing preconceived opinions and avoiding inconvenient facts. How else can one explain the careful selection of a “jury” comprising only prominent persons who have publicly voiced strongly anti-Israel statements and preconceived opinions? And how does one explain the fact that jurists and members of the public who attend will not be allowed to question speakers? Judge Richard Goldstone, well known for his criticism of Israel, said “It is not a ‘tribunal.’ The ‘evidence’ is going to be one-sided and the members of the ‘jury’ are critics whose harsh views of Israel are well known. In Israel, there is no apartheid. Nothing there comes close to the definition of apartheid under the 1998 Rome Statute."